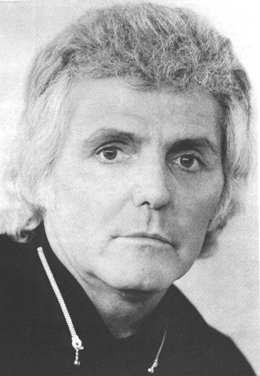 Tony Jackson (16 July 1938 – 18 August 2003) was an English bass guitar player and singer who was a member of the Searchers who quit the group at the height of their fame. Anthony Paul Jackson was born in Dingle, Liverpool, Lancashire. After leaving school he went to Walton Technical College to train as an electrician. 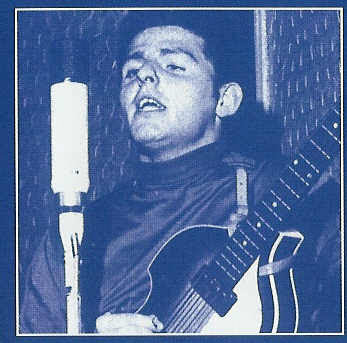 Jackson was inspired by the skiffle sound of Lonnie Donegan, and then by Buddy Holly and other U.S. rock and rollers. He founded the skiffle group the Martinis. Nicknamed Black Jake, he joined the guitar duo the Searchers, which had been formed by John McNally and Mike Pender in 1959. The band soon expanded further to a quartet with the addition of the drummer Chris Curtis. Jackson built and learned to play a customised bass guitar. Learning his new job on the four-stringed instrument proved too difficult to permit him to continue singing lead so he made way for a new singer, Johnny Sandon, in 1960. They played in Liverpool's nightclubs and the beer bars of Hamburg, Germany. Brian Epstein considered signing them but he lost interest after seeing a drunken Jackson fall off the stage at the Cavern Club. 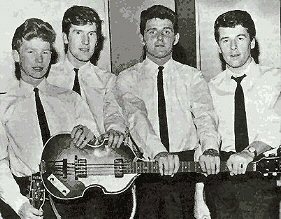 Sandon moved on in February 1962 and the band were signed by Pye Records in mid-1963 when the Beatles' success created demand for Liverpudlian acts. 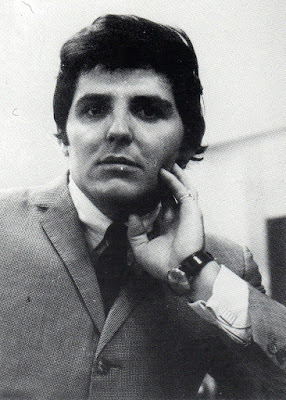 Jackson was lead singer and played bass on the band's first two United Kingdom hits, "Sweets for My Sweet" and "Sugar and Spice", but was not the vocalist on the band's biggest hit "Needles and Pins". He was featured on both "Don't Throw Your Love Away" and "Love Potion No. 9". In 1964 the band toured the United States, including an appearance on The Ed Sullivan Show. Jackson was unhappy with the band's move away from rock and roll to a softer, more melodic sound and felt that he was not getting appropriate attention. 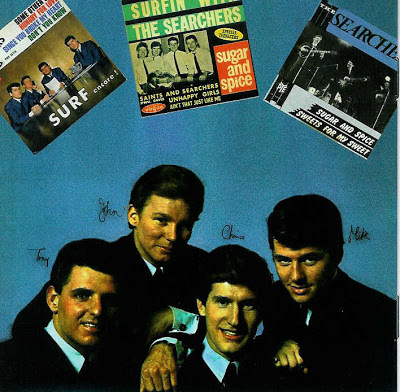 He left the group in July 1964 in some acrimony and immediately moved to London and put together a new band, the Vibrations, which had an organ-based sound instead of the Searchers' guitar based one. After leaving the Searchers Jackson spent £200 on cosmetic surgery on his nose. He said at the time that he had had a lifelong complex about his nose to the extent that he could not mix socially. The surgery had followed psychiatric treatment. That same year he revealed that his 1960 marriage to Margaret Parry had been effectively over for two years. 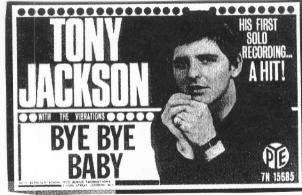 The Vibrations toured the UK with the Hollies, Marianne Faithfull and other acts. They released four singles on the Pye Records label but only the first had any success. 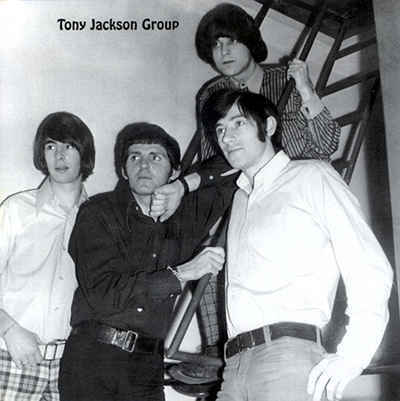 In 1965 they changed their name to the Tony Jackson Group but the fourth single also failed and Pye dropped them. The band then signed to CBS without improvement and they found that there were few bookings in the UK so they toured southern Europe until even that withered. Disillusioned and out of options, Jackson left the music business. Jackson took a variety of jobs including Spanish night club manager, entertainments representative, furniture salesman, disc jockey and golf club manager. In the 1980s he tried to establish a Searchers revival band, but was unable to compete effectively with the other two that already existed. 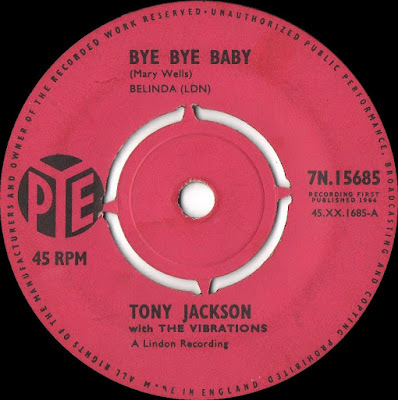 In 1991, Tony Jackson and the Vibrations reformed and an album of Jackson's material after the Searchers was released. The resuscitation of his career was short-lived, however, although he did appear four times with Mike Pender's Searchers between 1992 and 1995. That ended in 1996 when he was convicted of threatening a woman with an air pistol after an argument over a phone booth, and sentenced to 18 months imprisonment. The arthritis in his hands became so bad that he had to abandon even recreational guitar playing. In 2002 he said, "The spirit's willing, but the body's knackered." 12.I'm The One She Really Thinks a Lot of. 15.Is There Anything Else You Want? This CD contains the complete 1960s recordings of Tony Jackson following his departure from the Searchers. These are mostly cover versions of well-known songs, a pity really as the band was almost certainly capable of more. Nevertheless, this CD is full of excellent tracks including a number of rarities The CD is now deleted and is relatively difficult to obtain . Re-Up. Link OK for 30 days or more.